I somehow deleted most of the recent photos from my blog posts, and have spent most of the day restoring as many as I could. I wish I could say it was some stupid Blogger glitch, but I did it my own damn self. It will take me a few days to restore them all. Sigh. I have made baked chicken enough times over the past year that I have finally mastered it. I haven't made it enough times that I have gotten sick of it. At least I hope not because it is easy to make, lasts for a few days, and gives me plenty of backs and bones for killer slow cooker chicken stock. One trick I have been using is to bake the chicken over a layer of quartered onions that serve as a roasting rack. The first couple of times I just threw the onion away - after all, its job was done. But I kept thinking there was a better use to which I could put it. The next time I made it, I peeled some cloves of garlic and threw them in with the onion. I pulled them out and ate them with the chicken, but I threw the onion out again. It just looked like all the flavor had been cooked out of it. Then this last time I decided to try something that might give the onion a fighting chance. Instead of quartering it, I sliced it. I peeled about a head's worth of garlic cloves and chopped about a pound of fingerling potatoes in half. I layered everything in the baking dish and seasoned it all with salt and pepper, then poured a little olive oil over the whole thing. I placed the chicken pieces over the vegetables and seasoned them, adding thyme, marjoram and a little basil. I baked the chicken for about an hour and a half in a 350 degree F. oven. It was delicious, as usual. And the onions, garlic and potatoes worked beautifully well together. The potatoes were soft and creamy, the garlic was roasted to sweet perfection, and the sliced onions had caramelized, adding a bit of texture. Green beans with almonds rounded out the meal. I blanched about a pound of beans, then warmed them up in a skillet with a little olive oil, salt and pepper. 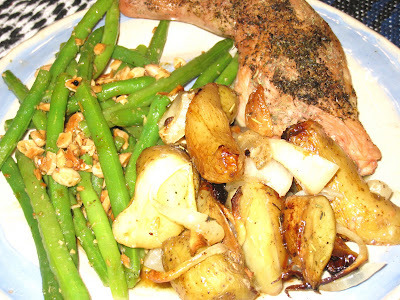 I threw in some toasted almonds at the end and stirred in about a teaspoon of fresh lemon juice right before serving. Arrange onions, garlic cloves and fingerling potatoes on the bottom of a 10 x 13-inch baking dish. Sprinkle with 1 tablespoon of the olive oil and season well with salt and pepper. Arrange chicken, skin side up, over vegetables. Pour the other tablespoon of olive oil over the chicken and run it into the skin. Season well with salt and pepper, then sprinkle the marjorm, thyme and oregano over the chicken. Bake in the oven approximately one-and-a-half hours, until the chicken is done. If the skin starts to burn, lightly place a piece of foil over the chicken pieces. Serve the potatoes, onion and garlic as a side dish to the chicken.